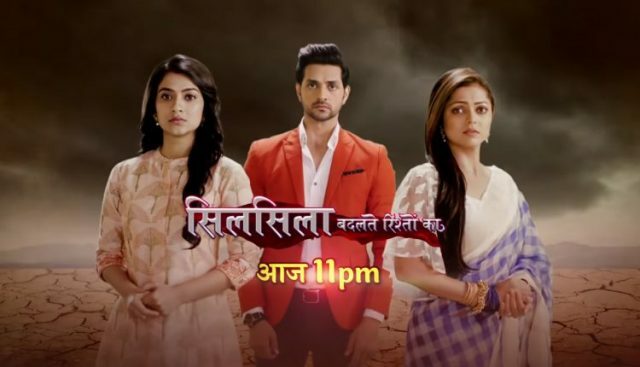 In the latest episode of Silsila Badalte Rishton Ka 2nd November 2018, Kunal marries with Nandini. In today’s written update starts with Nandini was broken her fast of Karva Chauth in front of the Kunal’s photo. She looks everything that was happening through the sieve, Kunal cames in front of it. To say all this situation Kunal comes in front of it. She breaks into tears to saw him and she was rubbing her hands over his face. Kunal assures that he is here in front of her. Nandini at once backs off and tolds him to stay with Mauli. He told to her that she is not pregnant. Kunal tolds to Nandini that Mauli will lie, she is not pregnant. There, Mauli throws her chunri off herself, breaks her bangles and start crying. Mamma asks the question to her that why she lied about her pregnancy. Mauli qualified that Kunal did not want to accept the reality. Dida said to her that there is must be some doubts in Kunal’s mind due to the Dr.Asha. Mauli had forbidden Dr Asha to tell to Kunal about the child. He saw that she fall down on the floor, and was not concerned is she hurts or not. He was instead doubtful. It was her fast, he still wnt to Dr Ashs. He is denying this child’s presence, she can not put this child’s responsibility for him. He wishes that this child does not exist in the world. How he can even think that she can lie to him about such a huge matter? Nandini was sure that Mauli cannot be telling lie about such a huge matter. Kunal bluntly said she did. Mauli requests to Mamma and Dida to think for once about this as a woman if she should select silence really told to Kunal about the child. If she should select silence and self-respect, or disgrace and Kunal. Mamma at once announces, that Kunal is not her son anymore and Mauli is not her daughter in law but her daughter instead. From now on, she will think that as the mother of a daughter, not Kunal. Dida cries but she decided to let Kunal leave. Precap: Nandini burns the crackers on the roof, Kunal happily watches her enjoy. Mauli cried of sufferings.